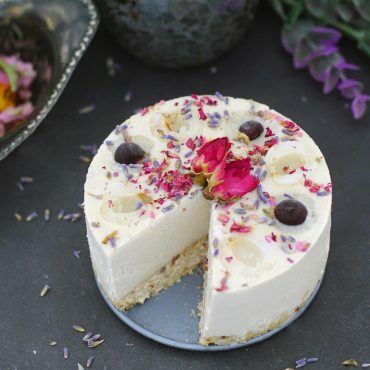 Ready for the easiest (and most super delicious) nut-free, dairy-free, and baking-free cheesecake? This one is a bit unique in the flavor department, with a special something happening that most other raw cheesecakes will never achieve. And the texture… super creamy and so satisfying. I think Dorothy Parker was thinking of someone like me when she said that☝️ — me in a nutshell when it comes to baking ? There’s really no limit to how many ways I’ll try to make a cheesecake. So how did I end up with this one? 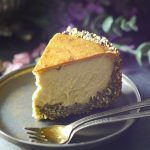 Some time ago I made this Nut-Free & Dairy-Free Baked Cheesecake as an alternative for a very popular nutty baked cheesecake (both recipes I absolutely adore), and learned that sunflower seed butter + dairy-free yogurt = pure deliciousness. I’ve often attempted to substitute nut butters with sunflower seed butter in some of my desserts to see if that would help out the nut-free crowd and found that its flavor is just very strong / particular / and not homogeneous within many desserts. But combining it with yogurt more than resolved my issues with using it in a cake. Somehow the flavor in this recipe almost resembles cottage cheese ? — an unexpected discovery that I was quite pleased with. 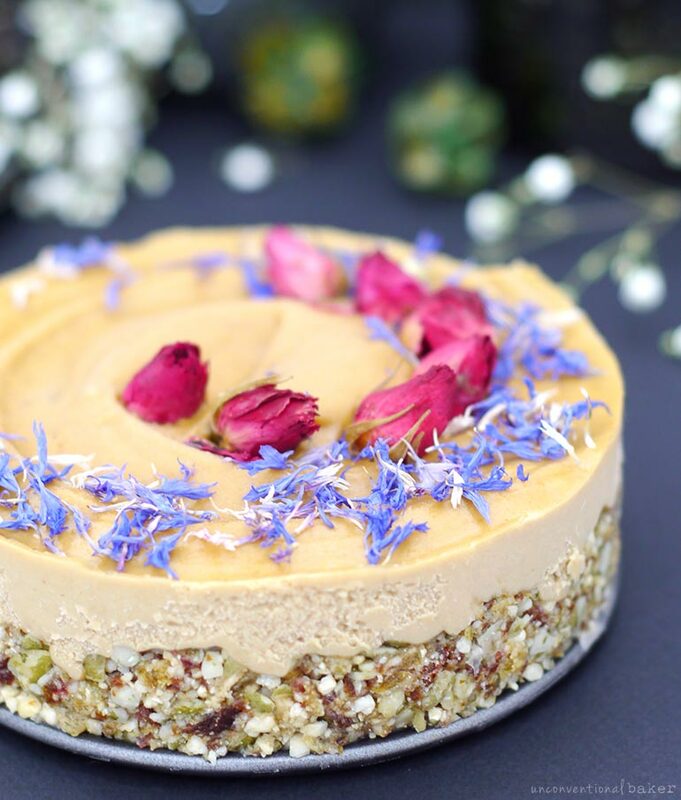 And the use of sunflower seed butter here does several things: it enables this cake to be dairy-free but also nut-free, and it’s rich enough naturally that you don’t need to add any additional oil (so no coconut here either, for those that mind). 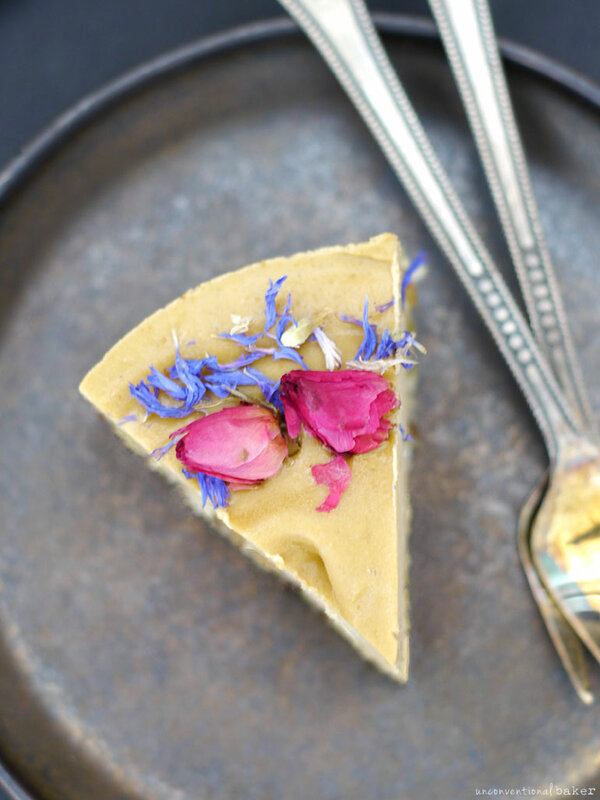 And if you’ve got a weaker blender / you struggle to blend down the cashews most raw cheesecakes call for, this recipe is perfect because the seeds are already pre-blended. Any blender should be able to handle this super easy cake. 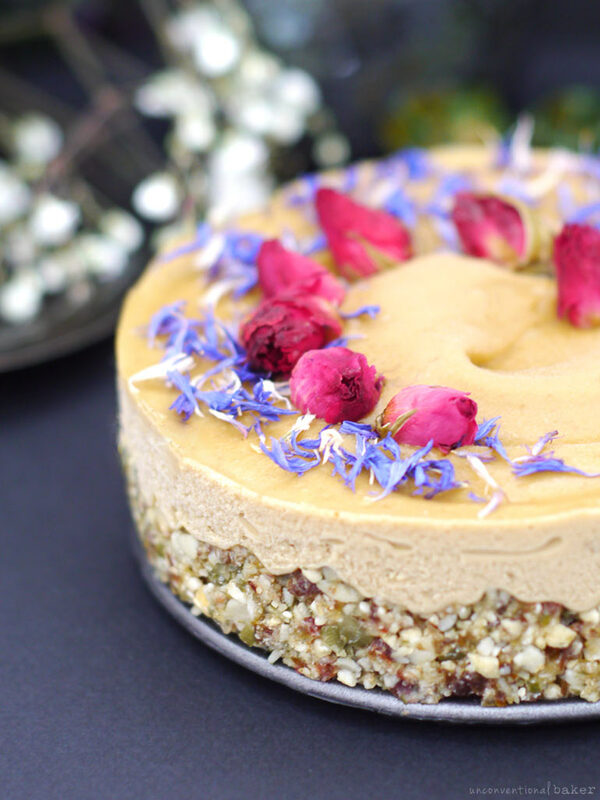 The sunflower seed butter also means no soaking or straining, so the whole process is rather streamlined and you can literally make this cake in 15 mins or less if you’re familiar with raw cheesecake making. And, most importantly, many people have asked whether there’s a way to keep the baked version I referenced above unbaked so as to preserve the enzymes and healthy culture in the yogurt — and voila! This no-bake version allows you to do just that. Last but not least, as usual, this recipe is for a small 5″ cake. To size the recipe up or down, you’ll find the downloadable cake sizing guide below handy. 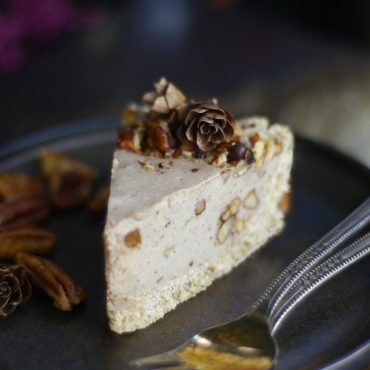 Cream no-bake, dairy-free cheesecake, made without nuts. Sweet, tangy, and totally satisfying! Gluten-free, vegan and refined sugar-free. Blend all filling ingredients into a smooth consistency in a blender. Transfer this mixture into the cake pan over the crust. Smooth out the top and decorate with desired toppings. Return to freezer and allow the cake to set for 5-6 hours or overnight. When ready to serve, remove from pan, thaw out a touch and enjoy! (keep leftovers frozen). This post contains affiliate links to the 5″ pan I used, as well as the rose buds and cornflower petals in this cake. Looks yum!! Could coconut butter be used instead of the sunflower butter? Or pumpkin seed butter? I’m pretty sure sunflower seeds are on my list of things to avoid. Thank you! Do you think it works with dairy yogurt as well? I’m not intolerant..
Hi Debora. It should work just fine with regular yogurt, but I’d go with a thicker one (like a Greek style yogurt) as dairy-free yogurts tend to be on the thicker side. Thanks — it’s simple but has a surprisingly new yet familiar flavor somehow. I loved it. Hello Audrey, Thanks for your lovely recipes for GF folks like me. 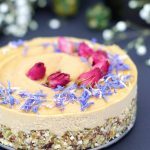 Is there another pan that would work with the sunflower seed butter cheesecake? Hi Deb. If you’re talking about a different springform size, then yes — there’s a guide at the bottom of the recipe on how to increase or decrease the recipe according to your springform pan size. 2. Use any tupperware container or regular cake pan of a similar size, but make sure to line it with parchment paper (I just take one larger sheet and stuff it in to fit the pan — make sure the sides are taller than the pan so you can pull the entire cake out with ease). The only thing with this option is that you won’t have the smooth sides — but the wrinkly / rustic edges are a look some people like anyways. 3. Use a tart pan with a removable bottom of a similar size.